The Minister for Climate Action will today hold a multi-stakeholder consultation to flesh out his proposed all of government plan to make Ireland a leader in responding to climate change. 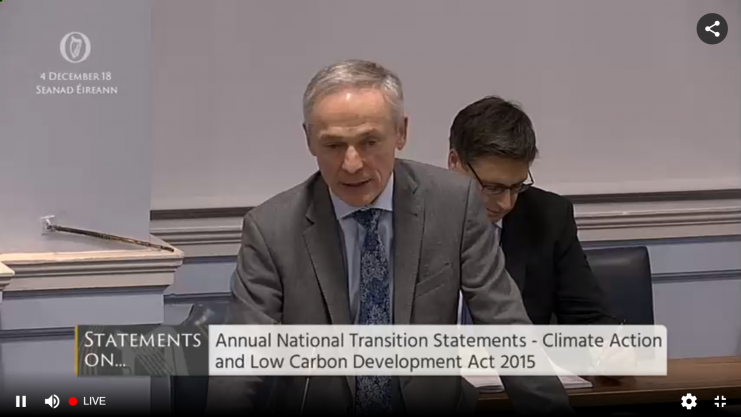 Last November, Richard Bruton announced that he had secured approval for the plan that will set out the actions to be taken by every government department and body to meet our national, EU and international climate commitments. Mr Bruton will today consult on this plan at Croke Park today with representatives from across a broad spectrum, including business, agriculture, environmental NGOs, academia and employer bodies. Break out sessions at the event will discuss a number of questions including how sectoral targets should be decided and set out and the best way to fund different measures. Sessions will also look at how the different government bodies can lead the way in tackling climate while also bringing the public along with them. Commenting in advance of today’s summit, the Director of Friends of the Earth (FoE) Ireland Oisin Coghlan said that Mr Bruton is starting to talk and act like “someone who takes the threat of climate change seriously”. Mr Coghlan said, however, that the stakeholder event must be followed up with “new policies and measures that reduce emissions in all sectors”, many of which he said are outlined in FoE’s 12 step programme to quit fossil fuels launched earlier this week. “The bottom line is that the new Climate Action Plan has to be as strong as landmark Citizens’ Assembly report on climate change. So far the Minister’s officials have studiously ignored its recommendations, first published over a year ago,” Mr Coghlan said. Last December, Mr Bruton admitted that Ireland will fail to meet our 2020 target of reducing emissions by 20 per cent below 2005 levels. Ireland is well off track to meet both its 2020 or 2030 climate targets or to decarbonise the economy as planned by 2050, according to the State’s own expert climate advisory body. Current projections, he said, indicate that we are likely to also achieve a one per cent reduction, leaving us 95 per cent off target. In order to close this gap, Ireland will need to spend between €6m and €13m on carbon credits, bringing State spending on emissions allowances up to around €120m since 2007. The latest projections from Ireland’s EPA is that on current trends, Ireland’s emissions will still be 13 per cent above 1990 levels in 2030.